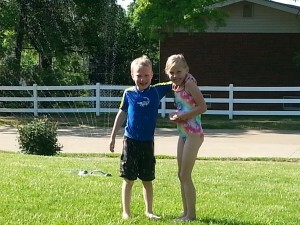 Swimming is always a summertime favorite for kids. However, it is important our caregivers and parents know that TLC for Kids’ temporary nannies are not allowed to take children swimming. This may seem disappointing at first, but luckily there are lots of fun water activities for toddlers and younger children that don’t involve swimming. Water activities are some of the simplest activities for kids to try, but ones they also seem to enjoy. You don’t even need a water table—all you need is a tub. • Add rubber ducks and boats to the water, so your children can race each other. • Add soap and some of their old toys. The children will have fun playing with the bubbles, and their toys will be nice and clean by the time the children are done playing. • Add rocks, leaves, and sand to the water. This is a great sensory activity; your children will have fun discovering the ways each item feels under the water and seeing what will float and what will not. • Add funnels, cups, and turkey basters from your kitchen. The children will enjoy watching how the water comes in and out of each item. As you can see, water-play is full of learning and easy to do. If you would like more ideas, visit our Pinterest page. Have summer plans? Call TLC for Kids to book your sitter today. Are you a responsible, caring, and energetic person looking for a job? The months leading into the fall, and the start of the school year, are TLC for Kids’ busiest season. TLC already has a large group of dedicated caregivers, but we are looking to expand our team. We are hiring now for the fall! Through TLC for Kids, there are different types of nanny positions available. There are permanent nannies, full-time nannies, part-time nannies, and temporary nannies. All of the different positions available come with different perks. Permanent and full-time positions are secure positions that come with benefits and competitive pay. Temporary positions have flexible hours (as a temporary nanny, you get to write your own schedule), and pay $12/hour for a minimum of four hours. For example, if a family only needs a caregiver from 6pm-8pm, they are required to pay their sitter for four hours worth of work. If you think you are interested in being a TLC for Kids nanny, call the office for more information or apply online today. Do you have a summer nanny working for you this season or an after-school nanny starting in the fall? Many of TLC’s clients hire a TLC caregiver to be their full-time nanny during the summer or a part-time, after-school nanny to help out during the school year. Having a nanny makes life a lot easier, but we often get phone calls asking questions about paying your nanny taxes. Talking about taxes can often seem overwhelming. Luckily, TLC can refer you to professionals that can help. We recommend using Breedlove and Associates for all your household employment needs. By definition, a nanny working in the home of a family is an employee of the family (even if the job is temporary, permanent, part-time, or full-time). The nanny is NOT an independent contractor. The ‘employee’ classification is determined by the nature of the work performed—not by how much the nanny is paid or the amount of time she is with the family. The IRS has ruled definitively that caregivers are employees of the families for whom they work. If you are only employing a nanny for a few months in the summer or for very part-time hours during the school year, you may not think you need to withhold taxes from your nanny’s wages, but you are most, likely mistaken. If you pay your nanny more than $1,900 (2014) in a calendar year, you, as an employer, must meet the household employment tax withholding and reporting obligations. You are required to withhold payroll taxes from your nanny’s wages and then report and pay those taxes to the tax agencies quarterly. Before your nanny starts, have her fill out a w-4. This form helps determines how much will be withheld from your nanny’s paycheck. At the end of the year, your nanny should be sent a Form W-2 detailing her wages, as well as the taxes that she has pre-paid throughout the year. Filing the necessary papers and to pay your nanny legally may seem like a hassle, but it is illegal for you—the employer—to fail to withhold taxes and file employment tax returns. Our friends at Breedlove and Associates, will take the stress out of paying your nanny legally and will educate you and help you take advantage of the tax breaks you may enjoy by doing so. Visit their website to learn how. Although summer has just begun, families are already searching for after-school care for their children. Some may think an after-school nanny position is just picking up the kids from school and taking them home for the evening. Yes, day-to-day tasks are part of the job, but being an after-school nanny is much more fulfilling than being a chauffeur. As a former after-school nanny, I got to become an integral part of the family’s life. After I picked up the kids from school, we would come home and enjoy an after-school snack. While the kids snacked on fruit and crackers, I would get to hear about the most exciting parts of their day: the new books they read at school, what happened on the playground, and if anyone disrupted class (believe it or not, elementary school kids have a lot of gossip). After snack, we would start doing homework. During homework time, I got to strengthen my bond with the kids. They were looking to me for guidance and trusting that I was leading them in the right direction, and I got to learn what excited them about learning and what they struggled with (If you are going into elementary education, or any other field involving working with kids or teaching, this job is an excellent resume builder). On the days the kids had ballet practice, I would go to practice with them. Like homework time, this strengthened my relationship with my kids because I got to see them doing what they loved. If the kids didn’t have homework or practice, we would come from school and play, read, or make arts and crafts. Other than getting to bring out my inner kid and have fun, being an after-school nanny also included picking up the toys, and occasionally helping prepare dinner. This was the perfect job for me during my beginning days of college—it allowed me to go to my morning classes, and I was off work early enough to finish my homework (and have a social life). Like I said, this is an especially great job for students, or anyone else who has free time in the afternoon. The hours needed for an after-school nanny are usually 3pm-6pm, or 2pm-6pm. Pay is typically between $12-$15/hour. If you are an energetic, caring, and responsible individual looking for an after-school nanny position, you can apply today. Share with us on our Facebook page why your husband makes a great Dad and we will give you $5 off your next agency fee. Did you know TLC for Kids also offers pet sitting? Lots of families go on vacation during the summer, but not every vacation is inviting for your furry friends. Instead of taking your family pet to a pet daycare, you can have a TLC sitter come to your home. Just like our sitters provide tender, loving care for your children, they provide the same caliber of care for your pets. Then, you don’t have to feel guilty about enjoying a vacation while your dog, cat, or any other animal is at home without you. When hiring a TLC pet sitter, there are a few different options. Some of our families hire an live-in pet sitter. In this situation, a TLC caregiver will stay at the family’s home, playing, feeding, and watching their pet while the family is away. The TLC caregiver makes sure she is not gone for long periods of time, and your pet receives the same type of attention as if you were home. Another option some of our families prefer is having a pet sitter come morning and night to feed and let out your pet. Or if you have an animal that doesn’t need daily attention, an appropriate schedule can be set up between you and the TLC caregiver. For example, some of our families that have cats hire a pet sitter to come once a day or every other day to feed and clean up after their cats. Hiring a pet sitter not only keeps your furry friend happy, but it also helps protect your home. Summer is often the prime time for break-ins, so having a sitter come to your house a few times a day or a week makes it less obvious you are gone. TLC’s pet sitting service is flexible and ready to work with your family to meet your family’s needs. Pay varies between jobs. Call TLC for Kids St. Louis at 314-725-5660 or TLC for Kids Miami at 305-256-5905 to book your pet sitter today. This Sunday is Father’s Day and TLC for Kids knows we work with some of St. Louis’s best dads. Our caregivers and staff know the dads we work with are hardworking, caring, and supportive. Because of this, we want to help our TLC families say ‘thank you’ to their dads this Father’s Day. 1. Make something for Dad. Homemade gifts are always a good gift for Dad (especially when you have young children) because they show you are thoughtful, creative, and give Dad something he can cherish forever. Popular homemade gifts for Father’s Day are items like custom coffee mugs, framed poems, hand-painted pictures, etc. Visit our Father’s Day Pinterest Board for cute gift ideas and how-to’s. 2. Learn a skill from Dad. Dads like to know their families value their abilities (and occasionally, dads like to show off their strengths)! Father’s Day is the perfect day to ask your dad to teach you how to do something that he does well. For example, if your dad is good at grilling, ask him to show you his tricks. Or if he’s a skilled carpenter, spend the day building a birdhouse together. It’s American tradition for dads to pass on traits to their offspring, and Father’s Day gives us the opportunity to carry out and uphold this age-old tradition. 3. Take Dad to his favorite activity. Like we said earlier, we know the dads who are a part of TLC are hardworking individuals. When people, like our hardworking dads, have demanding schedules, they rarely make times for themselves to do the things they enjoy. Father’s Day is the perfect time to let Dad know he deserves a break by taking him to do his favorite activity. His favorite activity could be anything from going for a stroll in Forest Park, hitting the links on the golf course, watching his favorite sports team, or enjoying a delicious meal at his favorite restaurant. Whatever your dad likes to do, Father’s Day is the time to tell him how much he deserves a break. Have plans for Father’s Day? Call TLC today to book a babysitter for your family. Our last blog focused on preventing sunburns this summer. However, sunburns aren’t the only thing you need to worry about this summer. Spending time outdoors also increases chances for bug bites and bumps and bruises. Take a look at these preventive steps to help ensure you and your nanny are safe and healthy during the summer months. 1) Is there mulch, sand, or rubber matting under the play structure? 2) Is the play area/equipment age appropriate? 3) Is the play are fenced in? 4) Should your babysitter check the play area daily for hazards? 1) Avoid scented soaps, perfumes, or hair sprays on your child. 2) Avoid areas where insects nest or congregate, such as stagnant pools of water, uncovered foods, and gardens where flowers are in bloom. 3) Avoid combinations of sunscreen and bug spray. Sunscreen needs to be reapplied, and bug spray should not be reapplied. 4) Talk to your babysitter about how to properly remove stingers, ticks, and treat potential bites. It is important your sitter knows about any allergic reactions your child might have if stung by a mosquito or a bee. These bug emergencies may require medical attention such as administering an antihistamine, topical cream, or, if severe enough, an injectable medication such as an EpiPen or Ana-Kit. For children, these can typically be administered with the help of an adult. But do not take this for granted. You need to be aware of your state requirements allowing providers to administer medication. These regulations will determine whether or not your provider will be able to assist your child in the event of an allergic reaction. While allergies and risk of reaction might be seasonal, regulations allowing a provider to administer medication typically do not change as frequently. Keep this in mind when selecting a childcare provider. 5) DEET is considered to be very effective in repelling ticks and mosquitoes. Keep in mind there are differing levels of DEET, available in a variety of products. Higher levels of DEET are suggested for infants (older than 2 months) and young children. 1) Make sure your sitter knows the safest place to take the kids in case severe weather does arise. 2) How will you and your nanny communicate during the emergency? Be sure to always have updated emergency contact information on hand for your nanny and yourself. 3) Do you have a disaster kit readily available? The kit should include supplies to last up to 72 hours. If you do not have one, work with your nanny to make one. Communicating with your nanny about these topics will allow for your child to not only have a fun summer, but a safe summer! Summer is right around the corner. With an increase in temperatures, and kids out of school, everyone spends more time outdoors. More time outdoors means more sunburns. However, there are preventive steps to keep your child sunburn free. Share these tips with your nanny, so your child is always safe and healthy during the summer months. 1) Seek Shade: UV radiation is the strongest during midday. During this time, it is best to plan indoor activities (puzzles, reading, arts and crafts), but if you must be outside, try playing under a tree, an umbrella, or get creative with a tent. Talk to your childcare provider about proper planning of activities to decrease the amount of time your child is outside when UV rays are the strongest. 2) Cover Up: Most kids are uncomfortable with long sleeves and pants during the summer heat, but there are other ways to protect your child’s body. Hats are a good idea to wear outdoors because they protect the face, scalp, ears, and neck. Further protection for your child’s eyes is also important, so find sunglasses that offer 100% protection from UVA and UVB rays. Leave these items in an easy to find place, so your childcare provider is always able to properly dress your child for safe play in the sun. 3) Apply Sunscreen: SPF 30 is recommended every time your child goes outside (higher SPF coverage is always an option). Sunscreen should be applied thirty minutes before going outside, and reapplied often. Especially after any exercise or water play. Communicate with your childcare provider how often your child needs sunscreen and how much sunscreen your child needs. Communicating with your nanny about these sunburn tips will help keep your child safe this summer. Remember TLC for Kids has screened babysitters to help will all your summer childcare needs!